The 2015 NBA Playoffs begin this weekend and NBA Digital has it covered with extensive programming totaling more than 1,500 hours. NBA.com is prepared to deliver multiscreen content, customize hub pages for each playoff series and social media engagement for online fans. NBA TV is offering up to nine original programming games. Finally, NBA Mobile brings online fans all the real-time news, information and data about the teams, players and coaches via the NBA Game Time app. The Sports Techie community blog here based in Atlanta is excited to share this NBA sports tech driven story with our U.S. and worldwide readers and followers. Our company gratitude goes out Turners Sports for sharing with us. Stephen Curry, James Harden and Russell Westbrook at 7 p.m. Starting tomorrow, April 17, a new episode of the Open Court Series debuts at 10 p.m. EST showcasing a legendary assembly of the most famous clutch shots made in the wonderful sport history of the NBA. Host Matt Winer, leads the panel consisting of TNT and NBA TV analysis Grant Hill, Dennis Scott and Steve Smith with Hall of Fame member Isiah Thomas. Special guest is Hall of Famer and former Hawks great, Dominique Wilkins. Last year’s game winner by Portland Trailblazer Damian Lillard over the Houston Rockets was must see TV while Michael Jordan making one of the all-time best game winning baskets to propel the Chicago Bulls over the Utah Jazz seems to only get better with time. At 7 p.m. NBA TV presents One-on-One with Ahmad Rashad as he interviews the MVP season three performers – Stephen Curry, James Harden and Russell Westbrook – about their season-long preparations for the playoffs and reflections on All-Star hoops performances over the season. NBA TV get rolling tonight with exclusive shows focused on previewing the NBA Playoffs. Previews of the Eastern and Western Conference playoff teams is scheduled for 7 p.m. with highlights of all 16 teams that was not completely set until the last games of the regular season ended late last night. Look for, The Starters, a NBA Digital fan-centric representation of the sometimes crazy but always entertaining perspective of the game, starting at 6 p.m. with a special preview episode of the upcoming playoff second season, co-hosted by J.E. Skeets and Tas Melas. The Association: Road to the Playoffs, presented by Crown Royal premiers on NBA TV at 5 p.m. this evening by doing an all-access review at the road to the playoffs, with additional previews of the next steps for the Atlanta Hawks, Cleveland Cavaliers, Golden State Warriors, Houston Rockets, Memphis Grizzlies and Portland Trail Blazers. Loyal viewers and new fans will want to tune into NBA Gametime as the show conducts studio coverage on a nightly basis featuring data-driven and expert insight mixed with commentary by league personalities all week long with live video feeds, player interviews and analysis of the playoff schedule. The first round games starts on Saturday with studio coverage throughout the playoffs anchored by Winer, Rick Kamla and Vince Cellini plus a proven assortment of analysts including Rick Fox, Hill, Scott and Thomas, among others. The network will showcase NBA GameTime every night throughout the playoffs featuring highlights, analysis, player interviews and coverage of live press conferences. 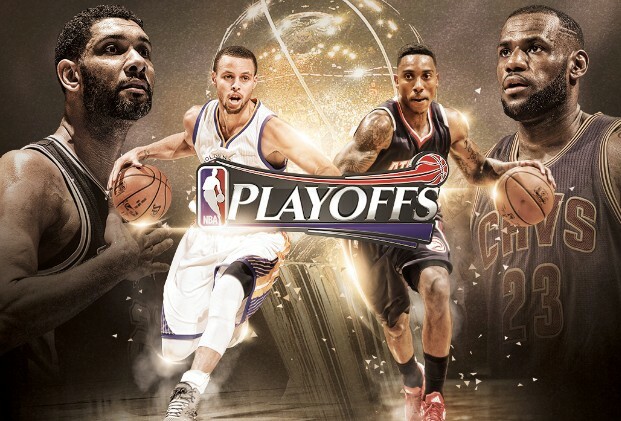 NBA TV will also televise Playoff Playback presented by Kumho Tire, 60-minute versions of each playoff game. The Starters – A collective of fan-focused voices with a unique and unconventional take on the game, will produce original daily content across all screens throughout the NBA playoffs, along with their popular weekly podcast, “The Drop.” Co-hosts J.E. Skeets and Tas Melas, along with contributors Trey Kerby and Leigh Ellis, will start off with a special playoff preview episode Thursday, April 16, at 6 p.m. on NBA TV, along with their weekday show throughout the playoffs at 5:30 p.m.
NBA Inside Stuff presented by Samsung Galaxy – The sports and entertainment all-access show will continue each Saturday at noon throughout the playoffs. Co-hosted by former NBA All-Star Grant Hill and Kristen Ledlow, the show combines behind-the-scenes access and interviews with the league’s biggest stars with today’s leading musical artists and all-new versions of “Jam Session” and “Rewind. Playoff Series Hubs – For every series, the Playoff Series Hubs will include video highlights, box scores, series stats and game stories, along with social media presentations for desktop and mobile web. Live Postgame News Conferences presented by Cisco – From the first round through the NBA Finals, NBA.com will present live postgame press conferences after every game, across all platforms. NBA Second Screen – A narrated real-time stream of curated content featuring social posts, embedded video highlights, game action photos, stats and editorial commentary that will provide fans a unique insider view to NBA playoff games. The stream will be available via NBA.com and the NBA Game Time app for all playoff and Finals games. Drive to the Finals Fantasy Game presented by Autotrader – Daily throughout the first three rounds of the NBA playoffs, fans will be able to select one player via NBA.com that they think will be a top performer for the chance to win a variety of prizes. Fan Duel Daily Fantasy Game – Free to all fans on NBA.com and FanDuel.com, the official one-day fantasy basketball game of the NBA allows fans in the U.S. to draft their own fantasy NBA team based on teams playing that day and compete against others for daily NBA prizes. TNT Overtime – Fans can watch enhanced coverage for up to 30 playoff games – more than ever before – with exclusive content and analysis from TNT commentators via TNT Overtime on NBA.com. The unique companion experience allows fans to watch the game via four alternate camera angles including slow motion replays. The product also provides an opportunity for fans to interact in real-time with an NBA expert and other fans via Twitter, receive enhanced stats and vote on the outcome of each playoff game. TNT Overtime will be co-sponsored by Sprite and Nissan during the first round, with Sprite continuing its sponsorship throughout the NBA playoffs. Smitty’s Mt. Rushmore – NBA.com’s meme generator – inspired by Steve Smith’s interview with LeBron James where the four-time MVP picked his foursome of all-time greats – will expand for the playoffs with a series of additional topics, in addition to allowing fans to choose their “greatest of all time.” Upcoming new themes include Best International Players, Most Stylish and Most Clutch. Once selected, users can name their mountain and then share across Facebook and Twitter. NBA Playoffs Pulse – Featured on the NBA.com home page with a mosaic layout, NBA Playoffs Pulse will present updates, news, video and photos throughout the playoffs. Leveraging the power of Facebook, Twitter and Instagram, Pulse keeps a beat on the NBA playoffs conversation – all in one destination. Modules include a “Trendicator” displaying in real-time the leading players across social, Player Dashboard content feeds, a global trending map, and interactive match-up hubs which capture photos and social for each series. #NBAPlayoffs Spotlight – #NBAPlayoffs Spotlight, presented by Crown Royal and Cîroc, will continuously keep fans up to speed on the latest tweets, photos and other social engagement by NBA players, teams and the conversations surrounding the playoffs. Highlights – Specialty highlights, including Top Plays, Dunks and Assists, will be featured throughout the playoffs. NBA Challenge – The NBA’s real-time predictive gaming experience will allow fans to interact during each playoff game. NBA Game Time – During the playoffs, users can follow all the action through NBA Digital’s mobile app available on iOS and Android including integration of TNT Overtime, Watch TNT and in-market streaming links to local broadcasts during the first round. Further, NBA Game Time will provide a bracket view, series dashboards, live scoring, game alerts, news and more. Autotrader and Bank of America will sponsor the app during the playoffs. Series Hubs – Linked to and from the series brackets, each mobile-optimized series hub will feature series-specific video, playoff headlines, game schedules and the latest Twitter activity for both teams. Series Hubs will be co-sponsored by SAP and Bud Light Mixxtail during the first round, with SAP continuing throughout the playoffs. NBA TV Mobile Web – Fans will have access to NBA.com content through their mobile devices with postseason stats, scores and standings, video series trackers and the playoffs series hub. List of NBA TV providers. Followed by NBA Eastern and Western Conference Preview Shows Starting at 7 p.m.
Sports Techie, there are no LA Lakers, New York Knicks or Oklahoma City Thunder in this year’s version of the NBA Playoffs but there will be the league’s best record earned by the Golden State Warriors, the return of the LeBron James led Cleveland Cavaliers to a title shot for the city with the longest streak to not win a pro sports championship, and the Houston Rockets Moneyball analytics approach to winning a championship. More good news to report is the NBA underwent a record breaking social media year by adding 240 million new fans since the end of the 2013-14 regular season – a 40% increase and largest single-year total. Overall, the NBA now has more than 811 million likes and followers combined across all league, team and player social platforms. To top it off, NBA.com and NBA Mobile achieved all-time traffic records during the 2014-15 season with over 16.7 billion page views and 4.2 billion video views combined, up 9% respectively when compared to the previous season. Additionally, the signature NBA GameTime App received a record 7.4 million downloads globally, up over 32% from the previous season. So what does this all mean? It means to get your smartphones, tablets and computers plugged in to the Internet, use an OTT device and power up your HDTV for another postseason second screen bonanza sure to inspire young kids around the world, adults and elderly fans alike to root on their NBA favorite teams, players and television announcers as they all march on towards an elusive championship trophy. Thanks again to NBA Digital and Turner Sports for pioneering the sports tech industry. Be sure to play the FanDual fantasy sports game and win some money. Remember the Alamo (San Antonio Spurs).